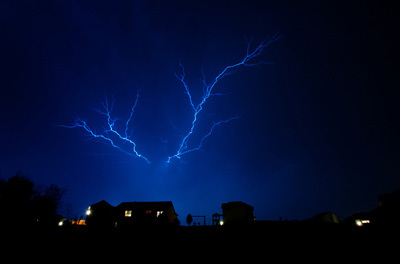 Grab Shot 30 - "Lightning"
"I shot this photo this past weekend during a thunderstorm," said Dan Polly. The lightning show was awesome, so I took a chance, grabbed my camera, and came away with this shot. The whole storm was very surreal, and this picture seemed to capture that feeling." Dan used a Nikon D70 in Aperture Priority set to f-8 ("I'm a sucker for this mode!" he says). The ISO was 200, focal length 13mm, and the exposure was a whopping 25 seconds. This is the best way to catch lightning, by leaving the shutter open for a while. You can also go the other way and set the shutter to 30 seconds in Shutter Priority mode. It's "lightning" -- not "lightening"
Years ago the phrase "it is lightening" was contracted to "it is light'ning" and then became further shortened to "it is lightning."